I kindly received #Forfeit in exchange of an honest review by the author. #Forfeit introduces us to Daisy Fitzgerald. Daisy married head over heals at the age of 22. Now three years later, it's oll over. Daisy runs away to Gosthwaite to leave her past behind and start a new quite life. She wants to concentrate on her new job as a teacher and on designing bags for Mulberry. Visiting a cricket game, Daisy literally bumps into Xander, a Knight-in-Shining-Cricket-Pads. From the first moment they met, there is a electricity and tension between them. Daisy defends herself against her feelings for him, he is just too young and too good looking. Daiy spends more and more time with Xander, so she meets also his friends. Daisy agrees to play Forfeit, the ultimate game of dares. Pay the stakes, roll the dice, do the dare... A simple kiss dare ignites her relationship with Xander, but the game's called Forfeit for good reason. Too soon things start to get out of control. Who can she really trust? Sadly, this book was a disappointment for me. I was very excited when author Caroline Batten approached me for a review request. The book sounded very interesting, a story with a unique storyline, interesting characters and unexpected things to happen. I was looking forward to get stuck into it. Now I realize, this book was really not worth the excitement. I'm so sad even saying these words, because I do appreciate the effort and what the author tried to accomplish with this book, but it just didn't work for me. I want to love all books and recommend every book I read but you just can't, if you want to give honest reviews. The book had an interesting start. I was intrigued by the characers and the storyline to keep going. In the end, reading this book felt like a chore instead of a pleasure. I liked Daisy in the beginning but at some point it somehow turned into the opposite direction. She was a fraud - a drug taking, self-centered superclub-frequenting fraud (that's the way she describes herself). The last year has been hard. She use drama as an excuse to drink too much and stop eating. Daisy was utterly, tragical jealous that caused a lot of trouble. Daisy and Xander's relationship is a living hell of a roller coaster ride. The one second they are blissfully happy, in the other they're a disaster. It was his job as a chef. It was killing them. Well, also the number of girls he'd shagged were killing them. And Finn, her ex-husband wasn't helping either. Even though they hurt each other badly, they found their way back! All this drama was too much for me and stopped me from enjoying the book. In this books are too many complex characters. Starting from Xanders friends, a bunch of spoiled, rich adults behaving like kids. I could not sympathize with any of them.The one character I very enjoyed reading about was Clara, Daisys best friend, her ex-partner in crime who has given all of that up to marry Scott and have their first child. She was the one giving Daisy a swift kick up the arse to get things right. I would have loved to read more about her. #Forfeit's storyline was fast paced and full of action and drama. I liked the twist and turns that Batten added to the story, sometimes they took me by such a suprise and I thought "Did that just really happen?" Battens writing style is very british, engaging and vivd. 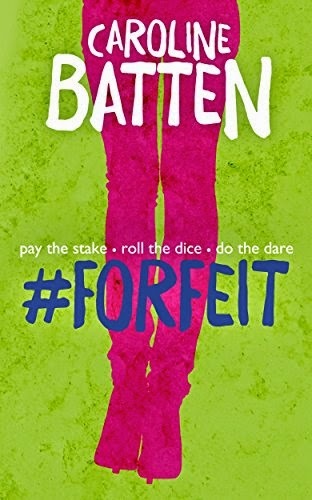 I am pleased to see that #Forfeit and Carolina Batten has solid fanbase of her book and all I can say is that I wish her all the best for her future and upcoming releases.